It’s been a while. It’s not like there is a shortage of stuff to write about, but there has been a shortage of time to write over the past few weeks. Ever since I got back from GP Chiba, I’ve been inundated with reports, business trips, and other events and haven’t really had the chance to keep up with what’s going in the standard and modern metagames in Nagoya. Recently I’ve gotten back into both, but it’s been slow going. The standard metagame has devolved into the Wild Wild West. Pretty much anything goes and power shifts happen daily from one deck to another. Yes, it is great that you can play whatever you want and do well with it, but keeping up with all the decks is extremely exhausting. Maybe it’s because of Modern season, but lately I haven’t felt like playing it that much at all. Another reason could be that I simply don’t have the chance to play the format any more. The last time I posted an article about the standard metagame around Nagoya was on May 4th. Lots has happened since then so I’ll try to condense everything down to a more digestible form. I had been using a Mardu Token control deck of my own design, “Shaolin Masters“ I called it, for most of May. The first week of trying it out, I went 3-0 with it at a casual 15 person event (beat Mardu Warrior tokens, Mardu dragons, and UW Control), and 2-1 at a 21 person FNM (beat Sidisi Whip and Esper dragons, lost to Jeskai Tempo). The winner of that FNM was Mardu dragons and Jeskai burn. That weekend I tried the deck out at a 49 person PPTQ but only managed a 3-3 record. I beat UB control, Esper Dragons, and Naya aggro that tournament, but lost to Abzan Renimator Combo, GR Ramp, and Abzan Warrior Company. I blame the results on poor play and keeping bad hands. The TOP 8 of that tournament was: GR Atarka Ramp, Sidisi Whip, GR Dragon Midrange, Esper Dragons x3, BW Warriors, and GW Aggro. The eventual winner was the Sidisi Whip deck. Sidisi whip also won another 22 person standard tournament the following day. During the first week Nagoya saw a lot of control decks entering the metagame, as well as Abzan Midrange decks. By the end of the month I was starting to give up on my Mardu control idea, and on May 20th I finally decided to debut my newest brew: Crouching Lion, Hidden Dragonslayer. What you see above is the most current form of the deck. I had experimented with Athreos, God of Passage and Nyxborn Shieldmate in the mainboard before, but they have been dropped/moved to the sideboard for other reasons. For some reason, I love devotion decks. I had played Red/White devotion back during Return to Ravnica/Theros standard and really enjoyed the combo feeling of the deck. While it’s not a true combo deck, it can be incredibly explosive. The strategy of this deck is to play a lot of white cards early on and to use their symbols to create ridiculously large Nykthos, Shrine to Nyx activations. Next, we have our spells. As with any devotion decks, you want to have permanents with colored mana symbols on them. This deck doesn’t vomit cards onto the table like Burning-Tree Emissary did in red devotion last year, but it does a great job of creating a formidable army. You’re not trying to burn out an opponent, but overwhelm them. You’ll sometimes have hands with a plains and a Nykthos, Shrine to Nyx but that isn’t necessarily bad for this deck. You’d still be able to play Mastery of the Unseen and Hidden Dragonslayer to name a few cards. Mastery of the Unseen is one of the best cards in the deck. It allows you to get overwhelming card advantage against an opponent, even if they were on the play. It also creates incidental life gain which makes it really hard for aggro decks to deal with. One of the best synergies of the card is with Anafenza, Kin-Tree Spirit. Whenever you pay 4 mana to manifest, Anafenza puts a +1/+1 counter on either it or any other creature you can Bolster with her ability. By turn 5-6, you could possibly be manifesting twice a turn and creating tons of card advantage. The drawback of this card is that sometimes you’ll manifest something that you really needed/wanted to play. 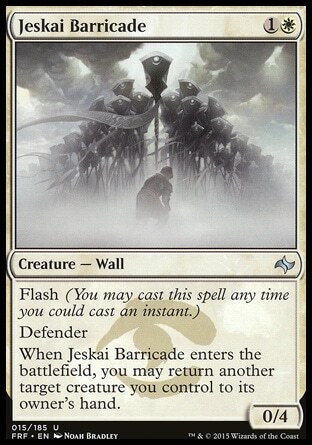 Initially, I had played Athreos to act as a way to “reset” the card, but opponents didn’t always help me to do that so I decided to be more proactive and play Jeskai Barricade from FRF instead. The beauty of this card is 2 fold. First off, it saves your creatures from being killed. This is incredibly important when you need all the devotion you can get for Nykthos. It’s also not a bad body. It blocks a large number of creatures and blanks Siege Rhino. The flash ability lets you activate an Anafenza trigger to save a creature from burn or a -x/-x effect too. What will really blow people’s minds is when you block with your manifested creature, flash this in and bounce back something like a Murderous Cut or Stance and then take out their other creature (this becomes even more important post sideboard when you bring in more removal). My best play with it so far was returning a Ugin to my hand then using my Nykthos to cast it in my second phase to wipe my opponent’s board. 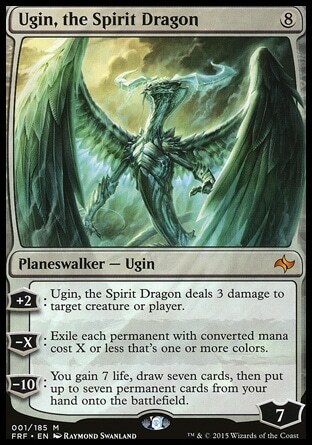 Speaking of Ugin, you’ve seen his -X cost, right? Exile each permanent that is ONE OR MORE colors. All those Manifested 2/2s you have building up on your turn? Perfectly fine. He’s great in a pinch if you need a board wipe (even if it exiles your stuff too), but can also easily take over the game if you can protect him for 2 turns. I had him in the sideboard before, but I think he belongs in the mainboard. The best opening hand you could have is Plains, Plains, Nykthos, Soldier of the Pantheon, Anafenza, Brimaz, Elspeth/Mastery of the Unseen. Turn 1 you play Soldier, Turn 2 Anafenza, Turn 3 Brimaz, and if you draw a 4th land on any of those turns you can add 5 to mana pool from Nykthos and play that land for the 6th one to play Elspeth on turn 4. You can also play a Master and activate it once for that same cost (not to mention having a 3/4 and 2 3/3s in the process). This won’t happen all of the time, but when you do get those type of god hands you can easily take over the game. Ugin’s quickest possible turn would be on turn 5 if you have 5 mana and played a another white permanent on turn 4. That’s not bad considering this isn’t a green mana ramp. The way this deck wins is by creating overwhelming advantage with creatures using Mastery of the Unseen, ultimating Elspeth, or by putting all your eggs into one basket and loading +1/+1 counters from Citadel Siege onto one creature and continuously swinging away until your opponent has no more blockers. Some of these choices might seem strange, but here is my thinking behind these card selections. Athreos, God of Passage – Good against control decks that play board wipes such as Crux of Fate or End Hostilities, also works well against slower Mardu/Abzan decks using a lot of removal. It also resets any manifested creatures you made since they die as creatures. Your Elspeth going to the graveyard? They have to pay 3 life of you get it back to your hand. Utter End – Sometimes you need that instant speed removal to get rid of a permanent and sorcery speed enchantments won’t do it. I like bringing it in against UB control to get rid of Perilous Vault. Also good against Ugin. Ultimate Price – definitely needed against faster aggro decks like the current GW aggro deck that plays Deathmist Raptor and Den Protector. Also good against mono red. Devouring Light – I had this in the main deck before but decided that Banishing Light had more utility and added to devotion. This is a good against aggro decks playing aggressive cards such as Deathmist Raptor, also good against reanimator decks. Virulent Plague – This card absolutely neuters Sidisi Whip (no zombie or bee tokens) and mono red aggro decks that play Dragon Fodder/Hordeling Outburst. Playing this on turn 3 gives you a lot of breathing room against those strategies and let you stabilize a lot faster. Mass Calcify – yes, this garbage rare is seeing some sideboard play! And why not? 7 mana can easily be paid for on turn 5 with this deck, and it destroys green devotion and ramp strategies. Pretty good against Mardu Dragon decks as well. Glare of Heresy – bye bye Elspeth, Siege Rhino, Sorin, Fleecemane Lion, etc. Still think it’s worth playing in the sideboard. This deck has gotten me back into standard thanks to its consistency. It went 2-1 at its first outing on May 20th at a 26 person event, beating Esper Dragons/Tokens and 4 Color Den Protector Dragons, but losing to UB control (too many dead cards game one, mulligan game 2). It went 2-1 again a few days later at a 22 person event, losing to the tricky Mono blue dragons deck (due to Perilous Vault and all those counterspells), but beating mono red aggro and a home brewed Jeskai Doom Engine deck. UB control and Mardu Dragons won these events, and overall the metagame had switched towards harder control at this point. Even the Mardu dragons deck was heavy on the Duress/Mardu Charms/Thoughtseizes in order to make it easy to take over the game later. The deck struggled in the second week due to bad draws and mulligans, but it surged back the week following GP Chiba. I went 3-1 at a 25 person event by shutting down Esper Control, Abzan Protector, and a BW/r warriors deck before losing a powerful BUG Dragons deck (stole my own Ugin with Silmugar and went to down on my life total after wiping my board). During June, aggro decks seem to have come back into fashion with Mono red aggro winning this event and a Boros aggro deck winning the day after out of 20 people. In other tournaments, GR Atarka Ramp and Green devotion won, meaning that those strategies are also on the upswing. That brings me up to the present in Nagoya. Control decks are still viable but have been dropping in numbers as ramp strategies make a comeback. My white devotion has been having a lot of problems with those decks as of late, so hopefully this new build with Ugin and Banishing Light in the mainboard will make the match more favorable. I look forward to tweaking this deck more in the future, and the recently spoiled Gideon from MTG Origins looks like it will fit perfectly in this deck! I look forward to it. Up until GP Chiba in the second week of May, the last time I had played Modern was on March 29th. I simply didn’t have the chance to do so. I can’t even remember the last time I did a “Modern Times” article on my blog. Back in February, March and April, everybody in Japan seemed to have caught the Legacy bug, and I even found myself busy putting together a legacy deck (I ended up putting together an Affinity build because it’s easier than playing UR Delver). I usually play Affinity in Modern as well, and played it last August at GP Kobe, but I felt a little bored with it so I went back to my “for fun” Modern red devotion deck. I played it at some small tournaments and it did alright. I went 3-0 at a 13 person tournament in March beating Esper Tokens, UW Gifts Ungiven, and BW Tokens and 2-1 at a small FNM back at the end of Februrary. It wasn’t until this month that I finally decided it was time to get serious about Modern again. I picked up my Modern deck, and with a new understanding of the metagame and how my deck worked, I decided to try something a little different. This is how I had always envisioned my Real Steel deck to be. I had originally tried out Tempered Steel in my Affinity deck before GP Kobe, but simply didn’t have the testing to add it in. Now I can confidently say that Tempered Steel is a great variant on an otherwise tried and true Affinity strategy. As you can see above, the deck’s core is relatively untouched. You still have the man lands of Inkmoth Nexus and Blinkmoth Nexus, you have the 0 mana creatures Memnite and Ornithopter, and of course it still plays Cranial Plating as the main win condition. The big change comes in the spells portion. Instead of playing 4 Galvanic Blasts, the deck plays Dispatch. 90% of the time this will be a 1 mana exile effect, and in testing I found it to be overall better against a variety of decks. It gets rid of a Tarmogoyf easily, and also gets rid of Tasigurs and other 5+ toughness creatures. Not playing the burn can sometimes be detrimental, as it makes some games go longer than they normally would and puts more focus on your creatures, but I find the trade off worth it. Instead of the usual Steel Overseer or Master of Etherium, this deck plays Tempered Steel to power up its creatures. I decided to play this enchantment for a number of reasons. Steel Overseer is a removal magnet – he always gets killed before doing any thing good, and ends up being a “win more” card in my opinion. If you get him late game he’s not that great, and if you play him early without being killed you’re probably winning already. It also opens your man lands and other cards to removal when you activate him to give your creatures counters. I also find him too slow. Master of Etherium is easy to hate out – the +1/+1 to all artifacts is great, and having him become a 5/5 or bigger creature on turn 3 or 4 is awesome, but Abrupt Decay IS a card in Modern. Kataki, War’s Wage also neuters this card if it’s played. Your opponent would like nothing better than having you sacrifice all your creatures and make him a more manageable 3/3. No assembly required – The effect is automatic. If you played 3 zero mana creatures turn 1 with Mox Opal and get Tempered Steel out on turn 2, you now have 6+ power on the board and if one of those is Ornithopter it’s out of Lightning Bolt Range. This is also great for man lands. If your opponent is playing an effect that gives all creatures -1/-1 or more like Elesh Norn or that black enchantment, Tempered Steel negates it. Sure there is hate out there for enchantments, and Abrupt Decay still hits it, but at least it doesn’t waste a turn or get you shut down. Since we’re putting more importance on creatures now, this makes cards like Etched Champion much more valuable. Not only does he get around almost all removal on the board, he also can’t be blocked. He’ll be your go to target for Cranial Plating, and with a Tempered Steel in play he becomes a countdown clock for your opponent. I think the rest of the deck is pretty much self explanatory. I feel that this build makes all of your cards of a threat instead of just the one with the Cranial Plating on it. A 3/3 Inkmoth Nexus also ends a game a lot faster than a 1/1 does. I also like how it allows me to play Spellskite as a threat in the mainboard while still giving me the option to redirect Splinter Twin or other effects to it. Many decks with red are now playing Flame Slash as tech to get around Spellskites, but with Tempered Steel that card is now almost worthless. I’d also like to point out that I think this deck has an advantage in the mirror. Not having to wait to get the boost of power will go a long way. 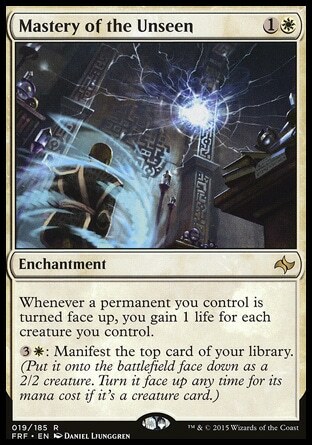 The sideboard is similar to most other Affinity decks except for a few cards. I believe that now is the time for Whipflare to shine. It destroys Delver decks, can reduce Elf decks to ashes, and also is pretty useful against Abzan Company decks. I also like it as a deterrent against decks with Kataki. Another card I’m currently trying out is Sunbeam Spellbomb. This is mostly a nod to burn decks or the mirror match to help give you another turn or two to stabilize/win the game. In all likeliness it’s a free spot that you can use for whatever your metagame dictates. The first time I took it for a test drive was at a 55 person win a MM2 box tournament in Nagoya. I went undefeated in swiss and kept on a tear until I lost in the semi-finals to a Junk deck. I played a Bant Traft deck in game one and beat it 2-0 on the back of Etched Champion in both games. Whipflare was great at killing his Geist of Saint Traft. In round 2 I beat a fringe Mono green midrange deck 2-0. The guy wasn’t even playing with sleeves . . . I faced a UB Tezzeret deck in round 3 and proceeded to beat him 2-0 as well. My deck was simply too fast, and a well timed Spell Pierce in game 2 locked the win. Soul Sisters gave me problems in round 4 due to double Serra Ascendants and double Soul Wardens game 1, but an Etched Champion with 2 Cranial Platings in game 2 and 10 poison from Inkmoth Nexus in game 3 put me into the top 8 with a perfect 4-0 record and at top of the rankings. The top 8 for this tournament was: Affinity (me), Mono blue tron, Junk, Slivers Company, Naya Zoo, Grixis Control, and Jeskai Ascension (Jeskai Storm). I was surprised to see so many aggro decks in the top 8, but then again I did face off against some strange decks that day. There were very few “real” decks at the tournament. Myself (Affinity), Slivers Company, Junk, and Jeskai Storm made it to the top 4, but Junk Midrange came out on top to take home the box of Modern Masters 2. I came close to winning, and found myself regretting the blocking decision I made to send my opponent’s 4/5 Tarmogoyf to the Graveyard instead of his Siege Rhino. I lost by one life when he attacked with 2 Rhino and 2 Treetop Village. Shame. I went 2-1 at my next 2 tournaments the following week at FNM and Sunday modern, coming across quite a lot of Twin decks. Last weekend, the 22 person Sunday tournament had 3 perfect records: Abzan Company, GR Tron, and Abzan Liege aggro. The metagame here is still packed with Junk and Twin decks, but others are breaking out. The PPTQ season is in full swing, and I expect the metagame to change as it continues. Sadly I won’t be able to participate in any this month because they are already filled up by people who pre-registered, but I am looking forward to playing in more Modern Masters 2 box tournaments going on this month. I think my chances are pretty good, especially with hardly anybody else playing Affinity! I have a chance! That will do it for today’s article, but there is still so much left to write about. My schedule for next week isn’t looking so bad, so there is a chance I’ll have some new material out by then. I really want to post about my trip to Osaka MTG stores from a few months ago, but I need the time to do so! We are also seeing a lot more Origin spoilers lately, which means it’s only a matter of time before the full spoiler is out. I hope you give both of these decks a chance and try them out at your next modern or standard tournament. You just might like them! I’ll be sure to keep you updated with any future results.